We love pasta for many reasons, they're cheap and versatile. Cook pasta according package directions. Drain and reserve 1 ladle pasta water. In large skillet over medium heat, add ground chuck beef, salt, pepper and worcestershire sauce, cook until no longer pink. Remove meat to a paper towel lined dish. In the same skillet add onions, bell pepper, salt, pepper, garlic powder and crushed red pepper, stir and cook until tender, about 4 to 5 minutes. Add meat back to skillet, stirring. Add sloppy joe sauce, diced tomatoes, italian seasoning, pasta water and stir in cooked pasta. Heat through. Sprinkle cheese, cover until cheese is melted, remove cover and stir. I love the down-home-goodness of your recipes, Christine! I'm sure plates are piled high w/this great dish! Thanks, Ally! I appreciate that. 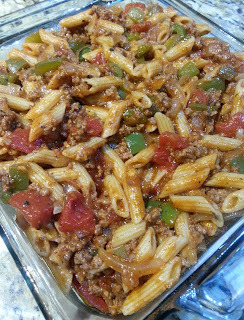 Oh my gosh... Really wishing I had a big plate of this sloppy joe penne right now! Yum! Wishing you had a plate full too. Thanks! This one is definitely new-fashioned comfort food. Impressive. A perfect family dish for those pasta lovers!